Armed with my newborn, a tripod and camera, I attempted to film this popular video - day in the life with a new born. I didn't have a camera man...there's no makeup and fancy editing, just a real day in the life with me and my little one. I hope you enjoy it and see the real side of life with a new born. In this video I show you my real day from waking up to putting baby down for the night. Warning - I'm not very glamorous. There's no makeup, the lighting isn't perfect, and I'm a new mom so I'm already expecting some comments criticizing the way I do things. 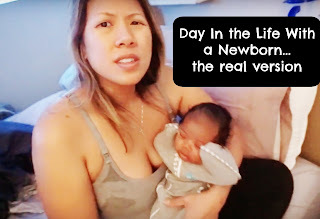 But I still wanted to keep this video super honest and real for those of you who really want to know what life with a newborn is really like. If you want to send baby girl a gift, Check out our Amazon Baby Registry!